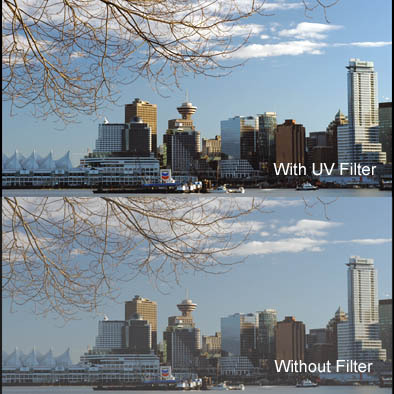 The above image demonstrates the way the UV filter reduces atmospheric haze. Many geographical regions contain particles (water droplets, pollution etc.) in the atmosphere that scatter ultraviolet light; this creates a hazy appearance, and causes poor rendition of colour and reduced contrast in the image. By blocking ultraviolet light, the UV filter prevents this from happening. Because the UV filter does not affect light in the visible spectrum, it can be kept on the lens without affecting the image in other situations. This makes it ideal for use as a protection filter as well.